Glass Bottom Boat at Avalon, Catalina Island. 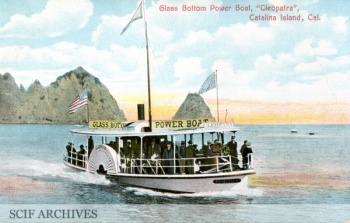 Glass Bottom Power Boat, Cleopatra, Catalina Island, Cal. 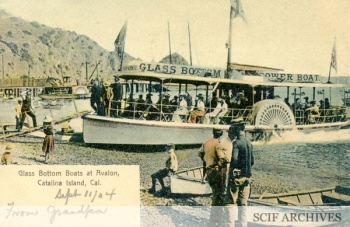 Glass Bottom Boats at Avalon, Catalina Island, Cal. 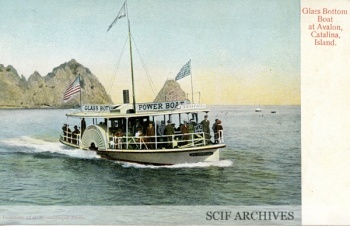 Cleopatra (#127766) (1903-1946), 44-foot gas side-wheel glass-bottom boat built at Terminal Island for the Meteor Boat Company’s excursion business at Santa Catalina Island. 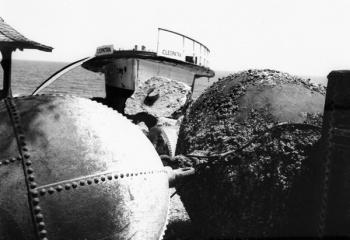 Cleopatra was the first side-wheel glass-bottom boat. Construction cost $15,000. The Meteor Boat Company built Lady Lou the same year. In 1920 the Meteor Boat Company and its assets, including Cleopatra, were acquired by the Wilmington Transportation Company. By 1945 Cleopatra was owned by Claude Sandy of Los Angeles. She was dismantled in 1946. This page was last edited on 25 August 2015, at 07:57.